Clarke MacArthur helped the Sabres remain undefeated on the road. Buffalo improved to 4-0 on the road with Wednesday’s win in New Jersey as the Devils fell to 6-4 on the season with the loss. It was Clarke MacArthur who put Buffalo on the board. MacArthur scored 81 seconds into the game for his 5th goal of the season. Welcome to Buffalo, Tim Kennedy! Rookie Tim Kennedy scored his first NHL goal six minutes into the game. 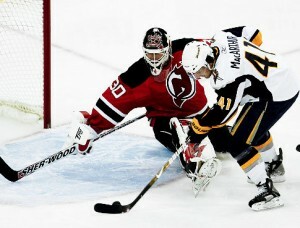 He came out from behind the net, spun around, and shot it past Martin Brodeur to give Buffalo a 2-0 lead. It was a goal Kennedy will never forget. New Jersey got themselves back into the game when Andy Greene scored a powerplay goal, his first of the season. That was all the Devils would get though. Buffalo did not give New Jersey any chance of a comeback. It was a solid game all around from Buffalo and it paid off in the end as they earned the two points. Midway through the third, Paul Gaustad scored his 2nd goal of the season, putting his team up 3-1 with ten minutes to play. Jason Pominville put the game away with a power play goal with less than three minutes to go in the 3rd. Buffalo now has 15 out of a possible 18 points this season. Defenseman Tyler Myers has one more game before Buffalo has to keep him up. General Manager Darcy Regier needs to make a decision before Myers plays 10 games. It would not be a surprise to see him stick around in Buffalo for awhile. New Jersey falls to 1-4 at home, while remaining a perfect 5-0 on the road. Former Buffalo Sabre Andrew Peters signed with the Devils, but did not play in Wednesday’s matchup. Ryan Miller improved his record to 7-0-1 on the season. Buffalo has held opponents to only 17 goals this season, best in the NHL. Bufalo will return home Friday night to host the Maple Leafs.